Oktoberfests were typically made in spring and aged in caves over the summer. 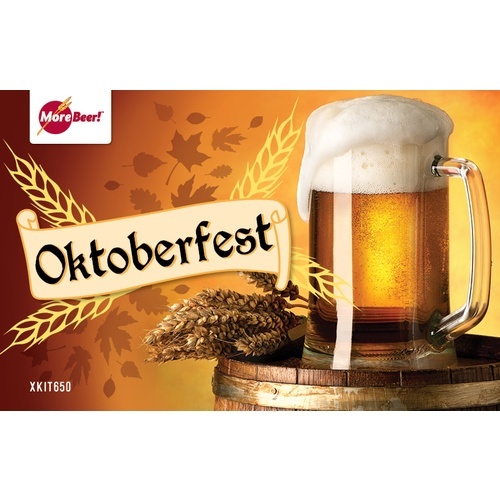 We've made this a "Special Oktoberfest" with ale yeast instead of lager strains! Try cold aging this beer in the fridge for a month before drinking. We like Octoberfest. Wanted to try it. Trying it out for the first time. Making it so it will be ready by Oktoberfest season. It nails the flavor perfectly. My wife loves this style beer while I don't. It gets 5 stars because it tastes like the kit says. I think the lager version of your Octoberfest made with Ale yeast is better, but this is still good. Newbie here. Not going to all the details. Only second brew and am very happy with the results. Only sat in primary for 2 weeks then keg for 3 days. First glass is clean finishing and tasty. Can't wait to see how it goes after another week or more in the keg. I will be brewing this again. Don't think I will be waiting for Oktoberfest next year to do it. Ive done a few lagers (tried) in the past and it really is a difficult style to get right if you aren't able to keep your temps on the mark. I don't have a spare fridge or a Kegerator yet to do them right. Someone locally recommended that I try using a Kolsch yeast instead of a lager yeast since you don't have to keep the fermentation quite so cold. I did just that with this kit. Fermented with WLP 029 Kolsch x 2 packs since I didn't make a starter, and I was able to keep ferm temps around the 58-64 range in my cool brew ferm jacket. Slow ish start, but by 72 hours it was doing its thing. Fermentation took around 3 1/2 weeks. Bottled it up and put them back into the cool brew jacket with ice blocks for 2 more weeks and then put in the fridge to "lager". since Im impatient I decided to try one before it had a full chance to "lager". It tastes so good I don't even care. Super crisp, maarzen like flavors, medium amber color, and it is crystal clear since the kolsch has a terrific flocc out. I happened to have some fresh Tettnanger hops that were ready for harvest that I tossed into the boil towards the end when I made this and I am really happy with how it turned out. 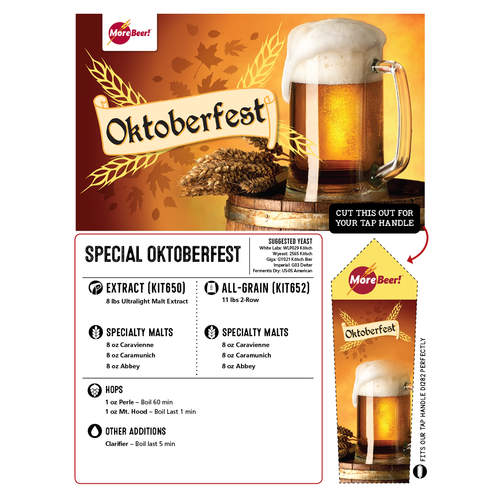 Part of me wishes Id purchased the Oktoberfest lager and done that with Kolsch to get that pilsner malt flavor but that will be my next project. We split this kit into 2 x 3 gallon carboys. One carboy had the german ale wyeast (1007), the other had kolsch wyeast (2565). Both turned out a very good drinkable beer. 2-month pos carbonationt-kolsch beer is very banana (banana bread), german beer is only slightly banana ester flavor (which could have been caused by fermentation temps slightly >60.). Overall a good tasting kit and would buy it again. I really enjoyed drinking this batch of brew. My friends all loved it and I even got a buddy to start brewing because of this kt. Very delicious and would recommend it to anyone who likes Marzen. I had great results with this one: it produced a beautiful, crisp lager-like finish. Light in color along the lines of Weihenstephaner or Hofbrau maerzen, not the deep amber typical of Spaten/Paulaner/Sam Adams Oktoberfests. I fermented the White Labs Kolsch yeast at 62F (the lowest temp they recommend) for 3 weeks then lagered at ~50F. This yielded great flavor... Much better than I expected possible! For my next batch I would definitely go with a big starter since fermenting this chilly really slows down the yeast activity. Attenuation was only 65% without a starter. NOTE: There is a typo in the recipe which recommends fermenting at 50C. Don't do that with Kolsch yeast! I am new to home brewing, this was the first beer that I made. It was awesome! great beer. And MoreBeer sent everything on time. all around great experience.